RIT’s National Technical Institute for the Deaf recognized several distinguished researchers dedicated to improving the lives of deaf and hard-of-hearing people. 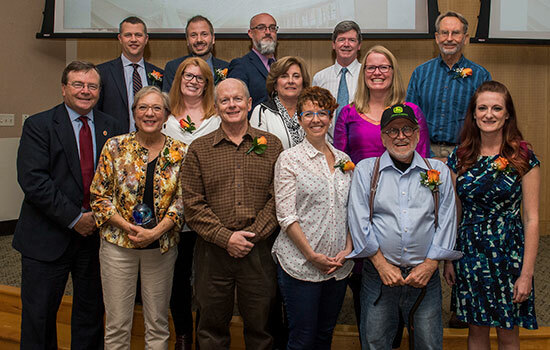 Rochester Institute of Technology’s National Technical Institute for the Deaf honored 12 researchers and program directors for their work leading to new knowledge, strategies or programs, and services to improve the lives of deaf and hard-of-hearing individuals. Scholarship Portfolio Development Initiative—Internal seed-funding opportunity for early-career faculty and contract research faculty whose projects typically represent the initial stages of projects that could attract external support in the future. Robyn Dean, assistant professor in NTID’s American Sign Language and Interpreting Education department, is investigating interpreter fatigue and how it can be exaggerated or mitigated by varying the way in which pairs of interpreters’ work. Jason Nordhaus, assistant professor in NTID’s Department of Science and Mathematics, explores the behavior of a black hole inside a giant star using dynamical 3D simulations. Corrine Occhino, research assistant professor in NTID’s Sign Language Laboratory, along with co-investigator Joseph Hill, is examining the variations in ASL that correlate to diverse regional, racial, ethnic and socio-economic factors and evaluating how ASL users regard the use of non-standard varieties of the language. Jessica Trussell, assistant professor in NTID’s Master of Science in Secondary Education program and researcher in NTID’s Center for Education Research Partnerships, is developing and implementing an intensive approach to reading comprehension for deaf and hard-of-hearing readers that requires students to work in collaborative groups. NTID Sponsored Programs Awards—A new award program that recognizes individuals who have made a difference. Awardees are nominated by NTID faculty. Student Research Mentor Award was presented to Bonnie Jacob, assistant professor in NTID’s Department of Science and Mathematics. Jacob is the principal investigator of the first all deaf and hard-of-hearing Research Experiences for Undergraduate (REU) program supported by the National Science Foundation. Her work has supported 17 student researchers. Up-and Coming PI Award was presented to Jason Nordhaus, assistant professor in NTID’s Department of Science and Mathematics. Nordhaus is affiliated with RIT’s College of Science and the Center for Computational Relativity and Gravitation and is nationally known for research describing stellar evolution. X-Factor Award was presented to Donna Easton, research assistant in NTID’s Deaf and Hard of Hearing Virtual Academic Community. The award, honoring those who support the work of a project team, was given to Easton for her critical contributions to 11 funded projects including C-Print® and the Virtual Academic Community. Collaborator Award was presented to Keith Mousley, associate professor in NTID’s Department of Science and Mathematics. Mousley’s work collaborating with other researchers explores issues connected to teaching math and other STEM skills to deaf and hard-of-hearing students. Co-PI Award was given to Myra Pelz, associate professor and co-PI for DeafTEC. For the past seven years, Pelz has been the full-time co-PI of DeafTEC, one of NTID’s signature programs with more than 29 partner high schools in 17 states. PI Award was given to Matthew Dye, assistant professor and Deaf x Laboratory director. Dye has launched a long-range program of research in cognitive neuroscience supported by a total of seven awards from National Institutes of Health, National Science Foundation and the Swiss National Science Foundation, as well as one Scholarship Portfolio Development Initiative award. Dye’s funded projects support the efforts of graduate and undergraduate research assistants. Partner Award was presented to Matt Huenerfauth, associate professor in RIT’s Golisano College of Computing and Information Sciences. Presented to a collaborator from one of RIT’s other eight colleges who has helped NTID realize its goals, the award recognized Huenerfauth as a key partner in projects investigating topics in mixed-mode communication and communication technology. He is the founder of the Linguistic and Assistive Technologies Laboratory, a bilingual (English /ASL) research lab. Pioneer Award was presented to Mike Stinson, professor and NTID research faculty. This award recognizes Stinson for his work developing speech-to-text technology for higher education classrooms and related to research on automated speech recognition. C-Print® is the first research-based speech-to-text (captioning) technology and service for educational use, and has been used in educational environments across the country from grade four through the postsecondary school system. Founders Award was presented to James DeCaro, NTID dean emeritus. This award acknowledges a lifetime of achievement in educational programming for the deaf and hard-of-hearing community and celebrates DeCaro’s success in spreading the knowledge and educational expertise of NTID faculty to the world. DeCaro’s vision and drive also were instrumental in establishing NTID’s first dedicated research facility, Rosica Hall, which is at full occupancy with four centers, one major program, one research lab, and other research projects that are largely funded by external grants.